In the early years of the twentieth century, the tiny resort of Frinton-on-Sea on the Essex coast was a haunt for the rich and famous. Chancellor of the Exchequer and future Prime Minister, David Lloyd-George, rented a furnished house there for one month in 1912. A review of the Court Circular of The Times from that era revealled countless lords and ladies spending a large part of their summer at Frinton. In the 20s, Frinton was also a magnet for well heeled sports men and women. It boasted a golf club with a reputation for difficulty in spite of its flat aspect. Frinton hosted a tennis tournament in the summer, and with nearby Walton-on-the-Naze, was a mecca for yachtsmen. It was this choice that gave Frinton, above all other resorts, its reputation for snootiness. Like many resorts Frinton swapped bathing machines for beach huts around this time and by 1921 had around two hundred huts which bathers could rent or buy. With demand high, securing a hut for the summer was difficult task. Once in possession of a beach hut, holiday makers spent the whole day in it. Either changing for a swim, lounging around in colourful striped dressing gowns or eating their meals in them. Already the practice of naming huts was very much in vogue. Some names from the early 20s were 'St Ronan's', 'The Poplars' and 'Actæon'. I recently discovered these pictures in a small photo album. They showa middle class family enjoying the beach at Frinton the 1920s. The family are on holiday with their children and nanny. 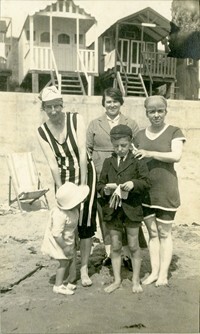 The boy is wearing his school uniform, whilst the two ladies are in bathing costumes. One costume has bold stripes and the legs finish just above the knee. The other lady's costume has slightly shorter legs, but has an overskirt. 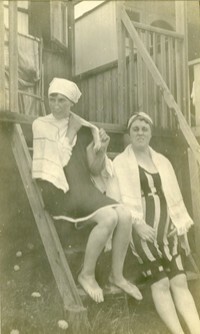 This style shows it is the 20s rather than the 30s when swimming costumes were still one piece but became much more practical. 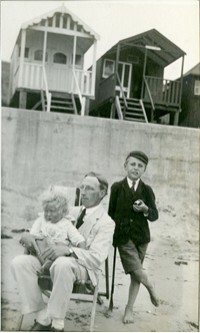 As you can see from these pictures, the style of beach huts has changed little since the 1920s. The choice of Frinton for this family was probably a good one. To devotees Frinton was quiet, relaxed and free from crowds. To others, Frinton was aloof, sober and snobbish. In August 1907 the lifeboat men at Frinton celebrated the launch of their new lifeboat, named after its predecessor, the Sailor's Friend. Nothing unusual in that, but the crew celebrated with water instead of wine as they were all teetotallers. In 1919 Frinton-on-Sea's golf club discussed a resolution to exclude from temporary membership, or as guests, anyone whose parents were subjects of Germany, Austro-Hungary or Bulgaria. In 1934 Frinton the councillors of Frinton declared the town to be slum free to the Ministry of Health, as did many larger resorts, including Bournemouth and Eastbourne, whose claims were probably more questionable. As recently as 1984, Frinton Council banned the sale of fresh fish on Frinton beach. In the swinging 60s transistor radios may have shattered the peace and quiet on Frinton beach, but anchored just off shore was the source of the unwanted noise. The waters off Frinton, in close proximity to the capital, were an ideal spot for pirate radio. The Radio Caroline boat anchored near Frinton. Other pirate boats also anchored there, including the Mi Amigo of Radio Atlanta and Radio London's Galaxy. For more on the history of Frinton-on-Sea, visit www.frinton.org/history/. See also the Wikipedia article about Frinton-on-Sea. 1. The Times, 4 August 1921, 'Frientuna and Frinton'. 2. The Times, April 1984, 'No fish please, we're Frinton'. 3. The Times, 29 April 1966, 'Good friends in pirate waters'.